Meizu will finally provide official Nougat updates to its devices in the next 10 days. The update comes in the form of FlymeOS 7 Closed Beta which is based on Android 7.0 Nougat and is currently available for Meizu PRO and Meizu PRO 6S with more devices to follow in the upcoming days. Since this is a closed beta, you will need to register on the official Flyme website to enjoy the latest Meizu has to offer. While registering ensure that you enter correct details about your device which include the model number and the region where you currently reside. 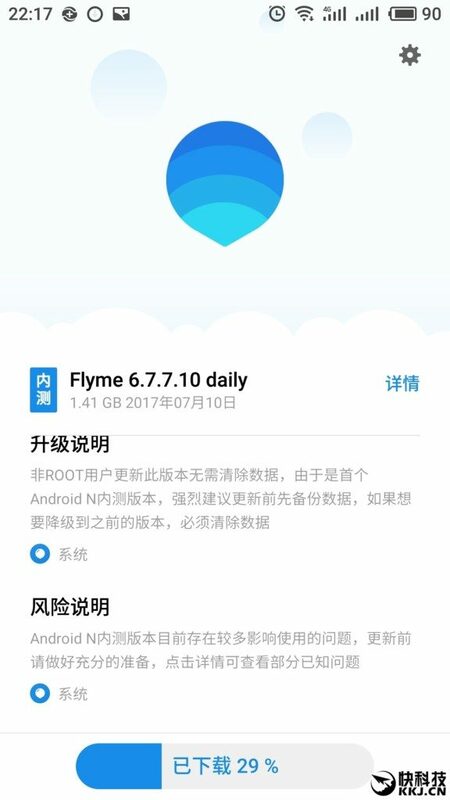 The current update for the Meizu PRO and PRO 6 is rolling out with build version 6.7.7.10 under the name Flyme 6.7.7.10 Daily and weighs in at 1.4 GB. The update will be available for your devices once you register for the closed beta. The company has specifically requested its users not to root and modify their devices as it hampers with the logging process. The FlymeOS 7 update, as of yet, is in its testing stage and contains a wide list of bugs ranging from camera malfunctions to experiencing bootloops after restarting the device. Users who wish to use the Nougat firmware as their daily driver would do better to sit this one out and either wait for an Open Beta which is slated to come out by the end of this month or the stable builds which could take a month or two to reach your devices. Besides the obvious changes brought by Android 7.0 Nougat, the closed beta introduces further optimizations to the camera, system, connectivity, and the UI of the Flyme OS. The update also adds support for several other features such as payment authorization for several services including Alibaba via the fingerprint scanner and introducing tap to pay like functionality baked into the firmware. With Meizu PRO and PRO 6 already receiving the updates, other models which will be upgrading to Nougat include the PRO 6 Plus, PRO 5, MX6, Charm Blue E, Charm Blue Max, Charm Blue Note 5, Charm Blue Note 3, and nine other models.